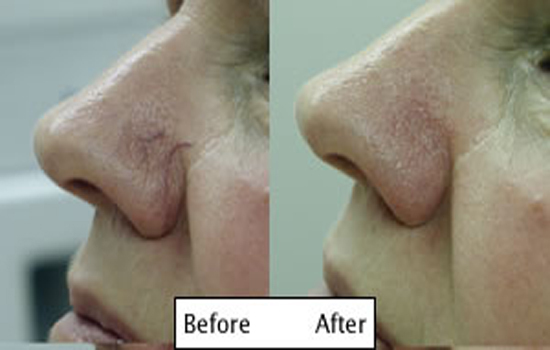 Yag Laser is a safe permanent removal of facial veins. What is yag laser thread vein removal? Yag laser targets the vein with energy pulses leaving the surrounding area untouched. The hemoglobin inside the vein absorbs the energy and causes the blood to vaporize and the vein simply collapses. The treated blood vessels will in time disappear naturally as the body dissolves the vein fragments. Vascular skin concerns such as facial veins commonly referred to as spider veins, thread veins and broken capillaries are often a result of genetics, sun exposure and other factors such as rosacea. Thread vein removal laser treatment is most effective for small to medium size thread veins. The latest advanced laser technology have given us a method to quickly and safely treat unsightly broken and dilated blood vessels without bruising or complications.